"We *Heart* Card Games" is a cosplay family originating from Missouri. These friends come from a variety of cosplay backgrounds but all share the desire to celebrate their love for their favorite characters through cosplay. Malindachan and Ex-Shadow (Kyle) are two of the leading founders of WHCG, and have been together as a couple since before the group formed. Malindachan especially loves wig styling and cosplaying from the YU-GI-OH! franchise, but she has also cosplayed from a variety of other series' and games such as Tsubasa, Outlaw Star, Pokemon, Digimon, Kingdom Hearts, Gurren Lagann and Tales of the Abyss. Ex-Shadow also has a large wardrobe of YU-GI-OH! cosplay work, but his favorites are his Jack Skellington, Vash the Stampede, Big O, and his original designs for the King and Queen of Hearts. Malinda and Kyle have been cosplaying since 2004, and it became their favorite hobby in 2007 after they started attending conventions together. 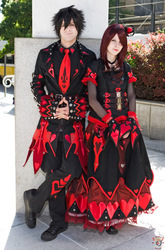 Over the years they have won multiple awards for their cosplay craftsmanship and performances and have been published in Cosmode, Otacool2, CosplayGen, and Cosplay in America.